The busy Holiday season is upon us! That also means we have been busy around here, trying to get as many new designs as possible finished and put into our two online shops (eBay and Etsy) and out to shops and galleries. There are still a few more things to be added in the course of the next week or so, but please keep in mind that every Alchemy Stone is unique, so if you see one that really appeals to you, the time to get it is "when you see it," because there will not be another "just like it" listed at a later time. By way of announcement, we also like to welcome our newest member of the Alchemy Stones "family!" 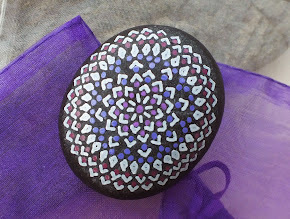 If you'd like to see the stones "in person," a large selection is now available from the gift shop at the Center of Holistic Wellness in Sedro-Woolley, WA. We're excited to be able share Alchemy Stones with folks in the Sedro-Woolley, Skagit Valley and Bellingham area! With the season of gift giving here, we hope you'll consider Alchemy Stones as a unique and different type of item for people on your gift list, and especially those with an interest in the spiritual and metaphysical. Orders placed at either of our web stores on or before December 18th should still arrive safely before December 25th! We appreciate your support during this past year, and wish you the happiest of holidays!